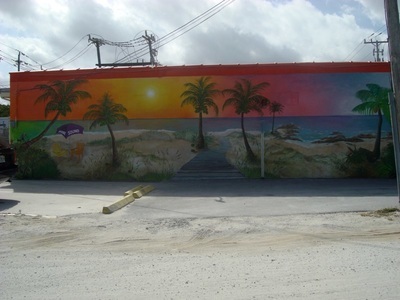 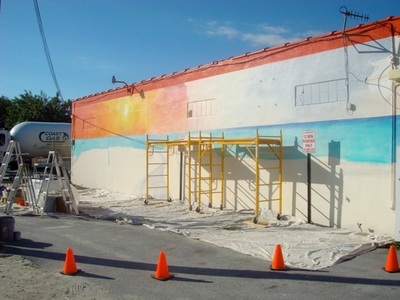 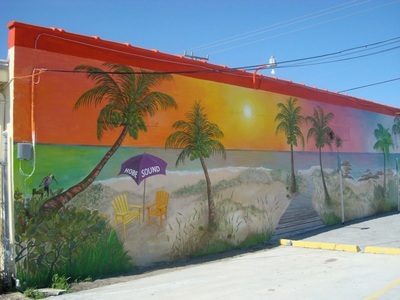 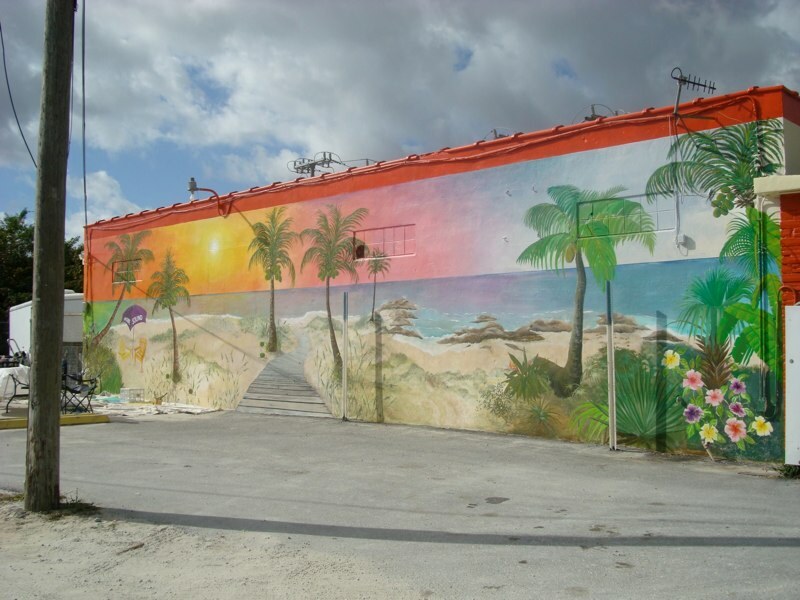 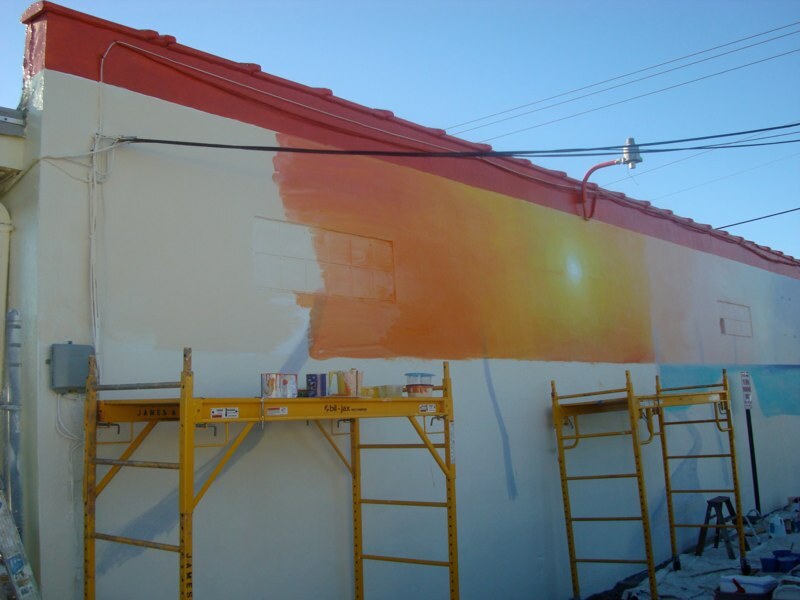 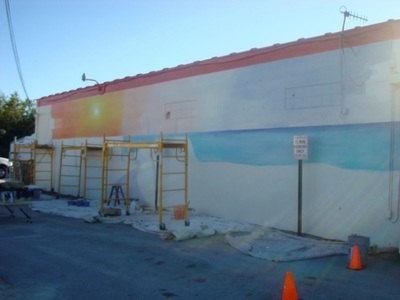 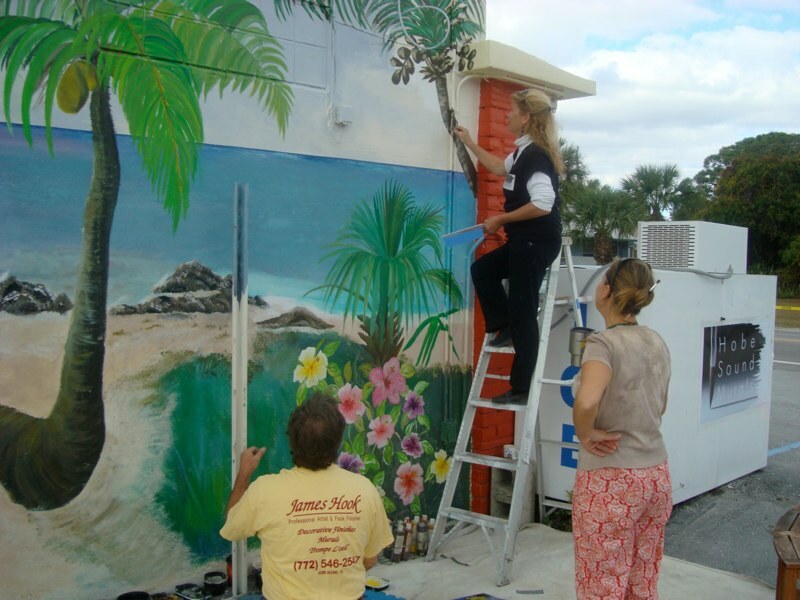 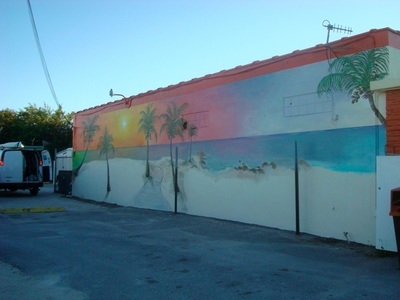 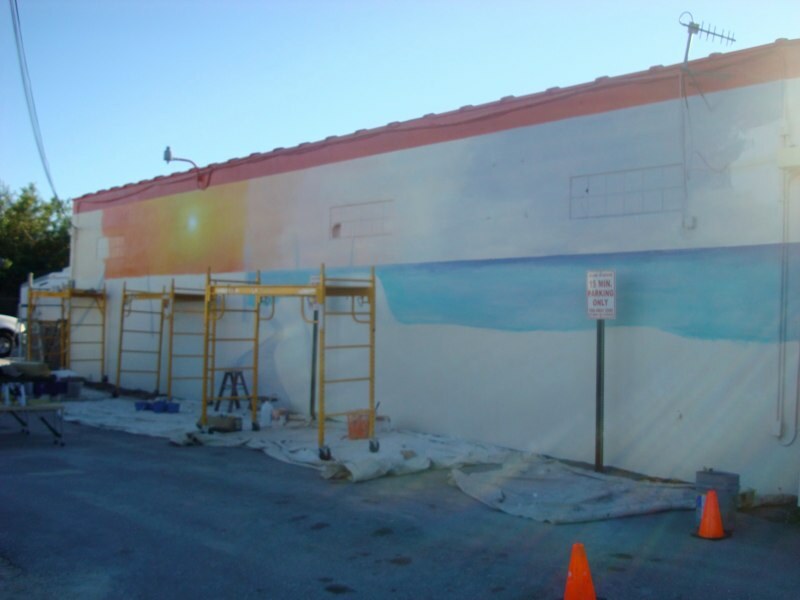 This mural was the first official mural of the Hobe Sound Murals project! 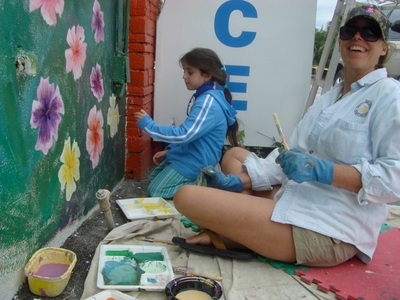 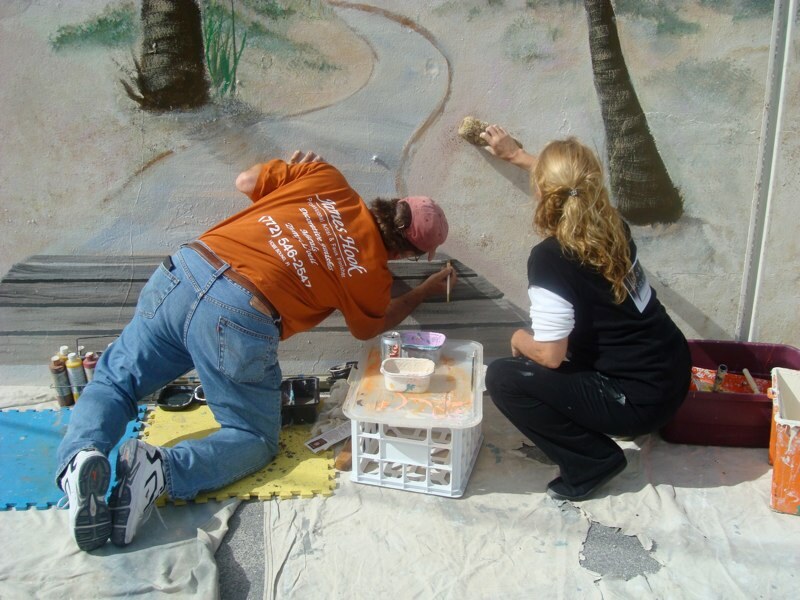 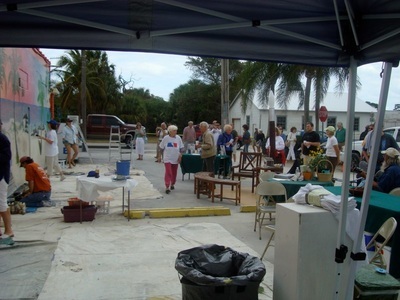 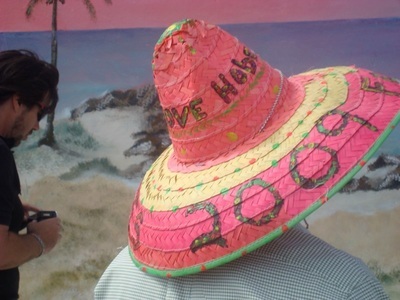 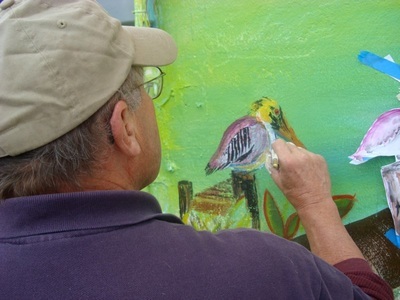 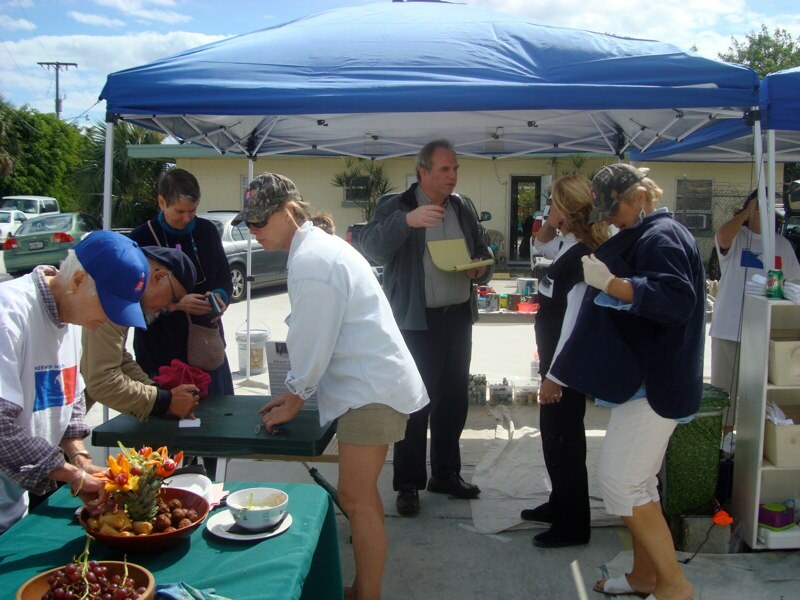 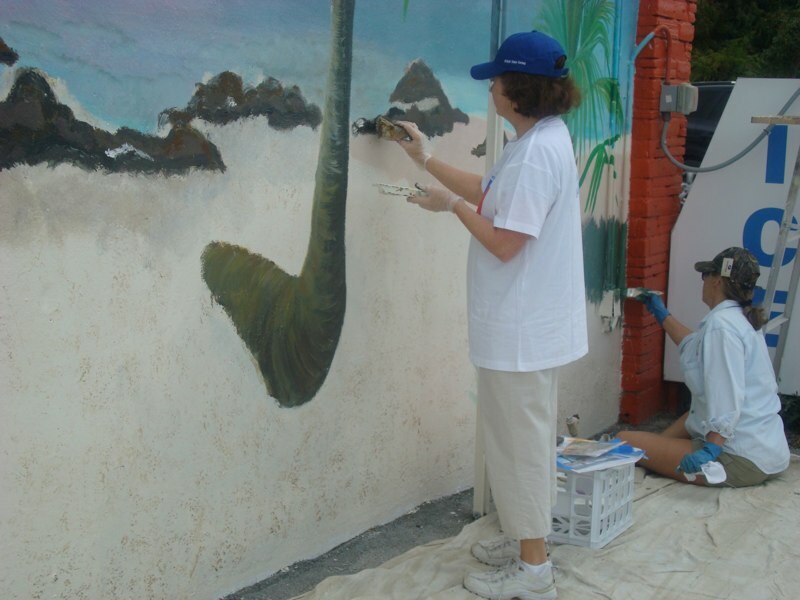 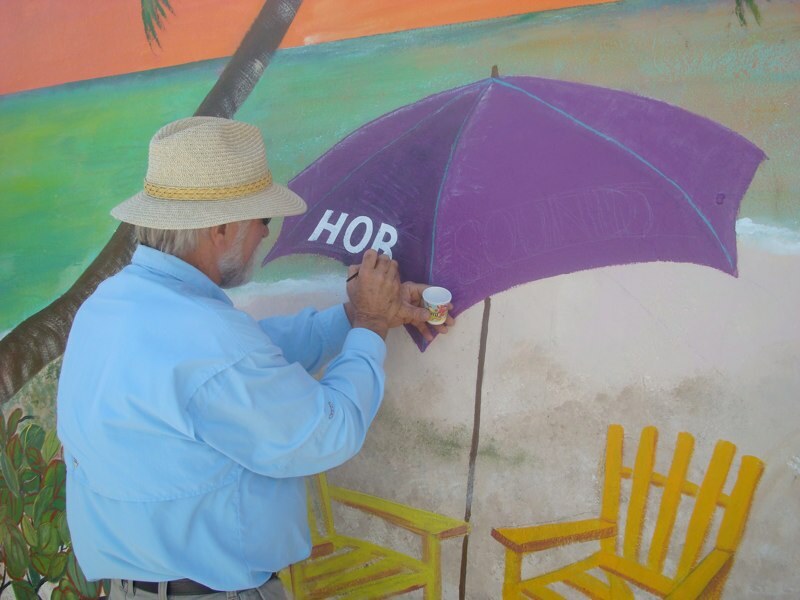 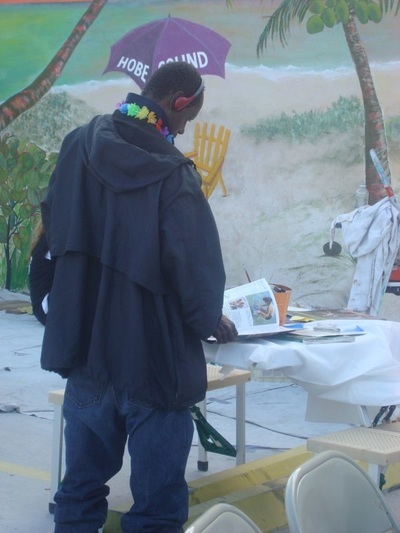 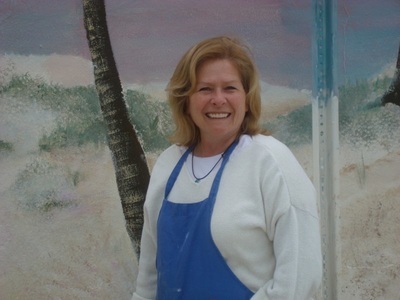 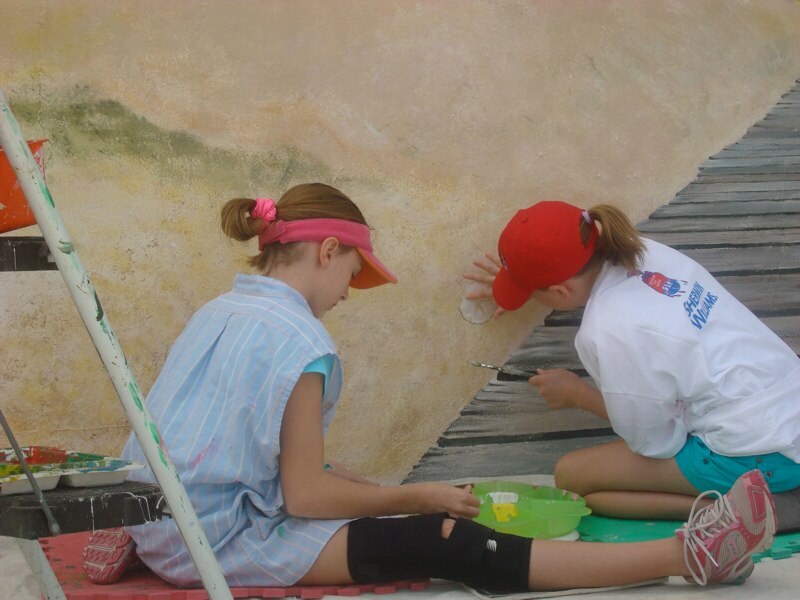 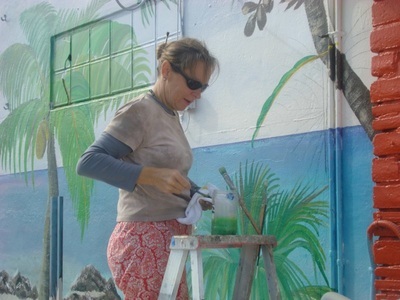 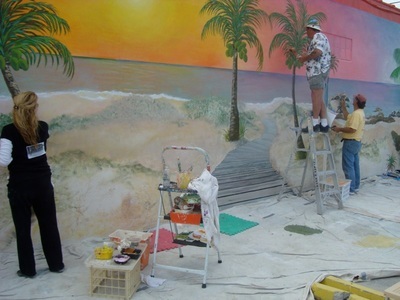 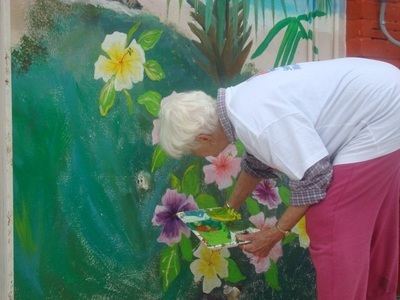 The main mural painting activity took place during the weekend of the annual Hobe Sound Festival of the Arts. 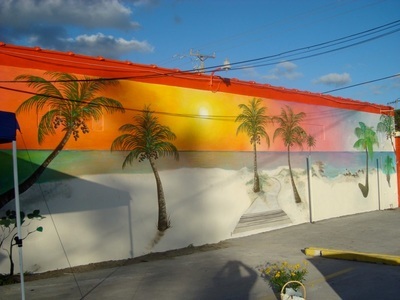 Mahendra “Mike” Patel, the building owner requested an ocean landscape theme... a sunset visual concept was prepared in keeping with the yellow tonality of his building. 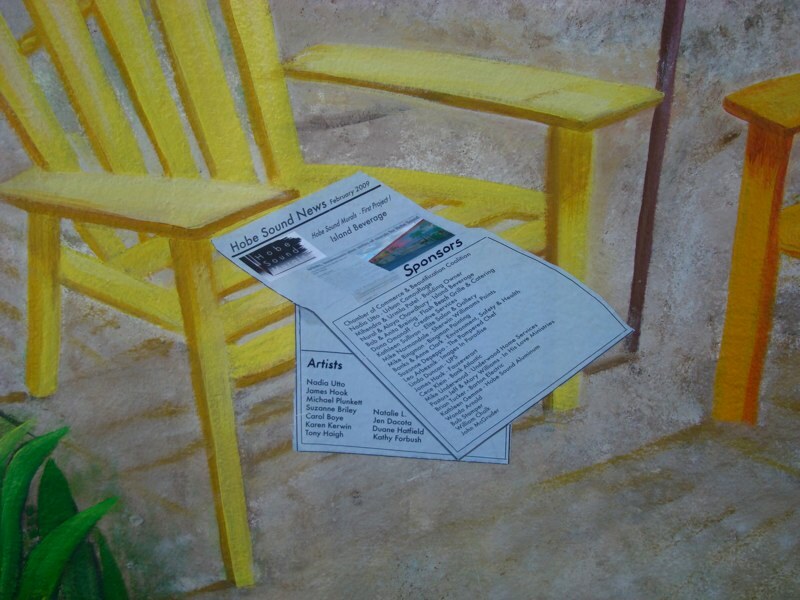 A number of especially generous and talented local artists along with the local “Barn Artists” group who meet weekly at Suzanne Briley’s barn, graciously volunteered to lend their enthusiasm and skills towards this kick-off event. 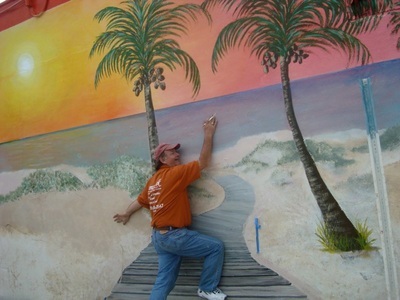 If a picture tells a thousand words, then a mural tells a million! 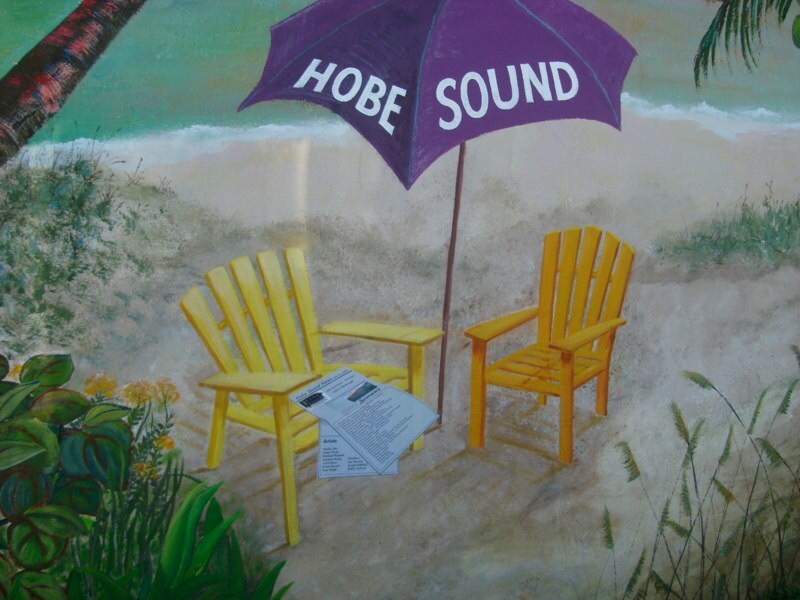 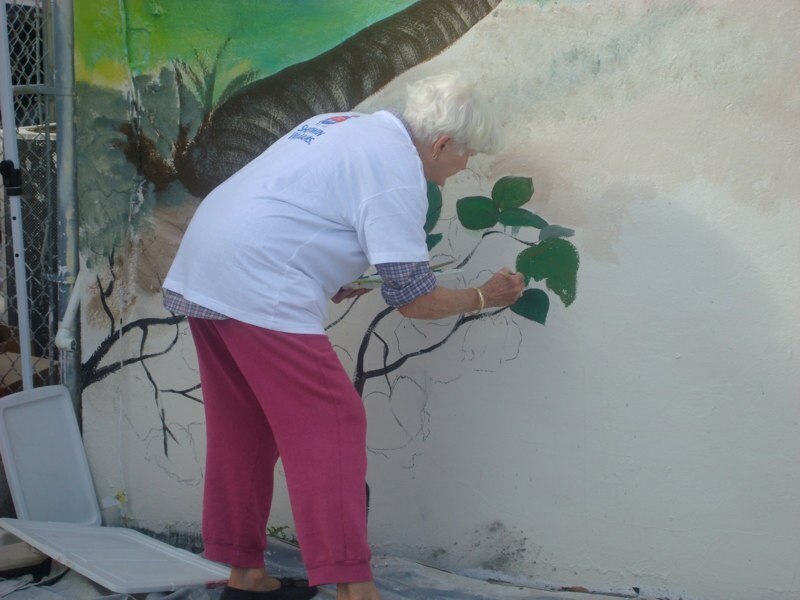 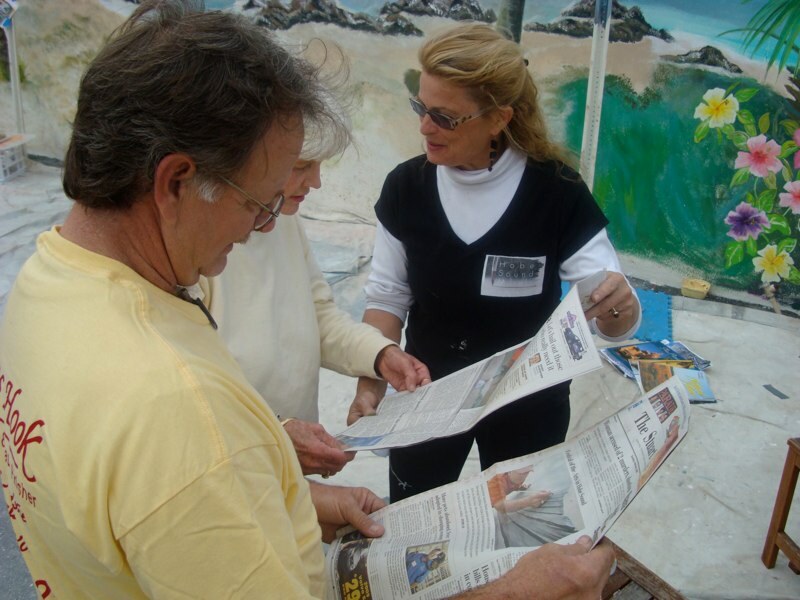 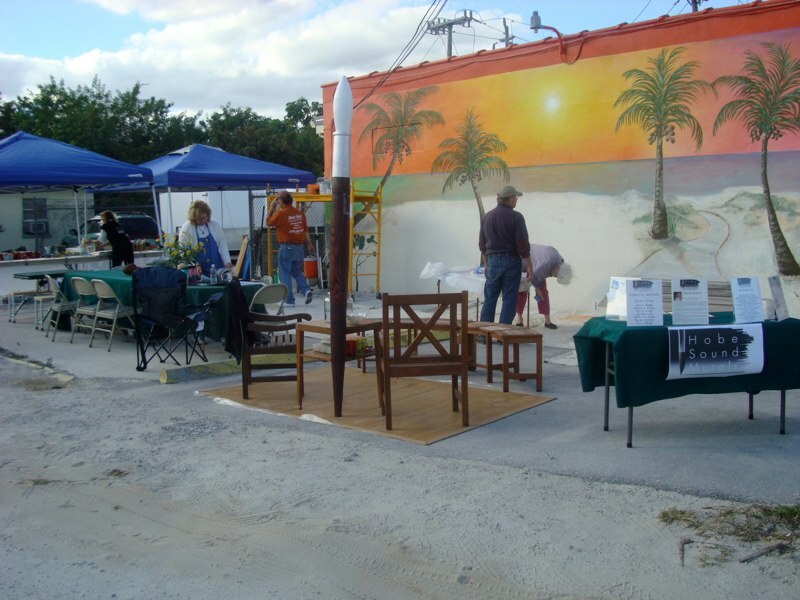 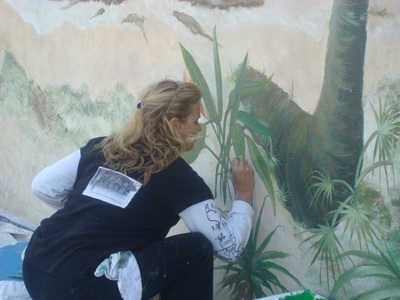 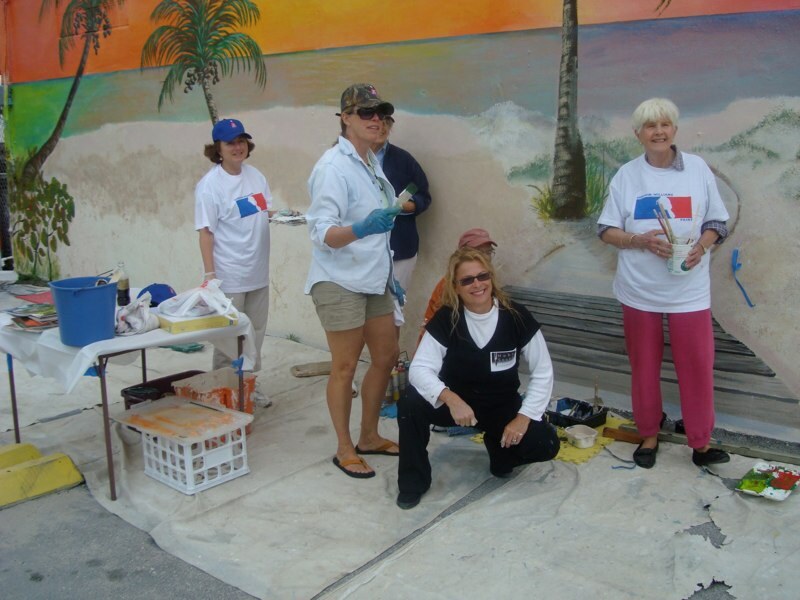 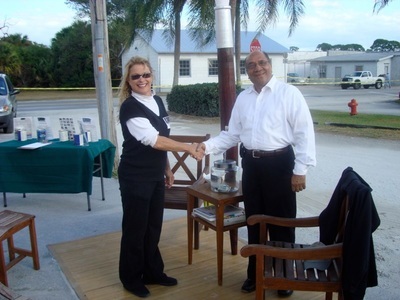 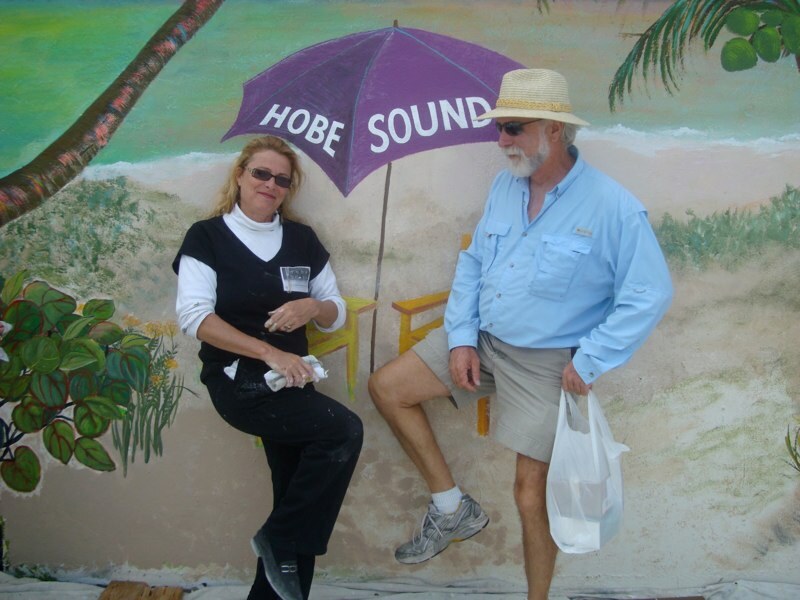 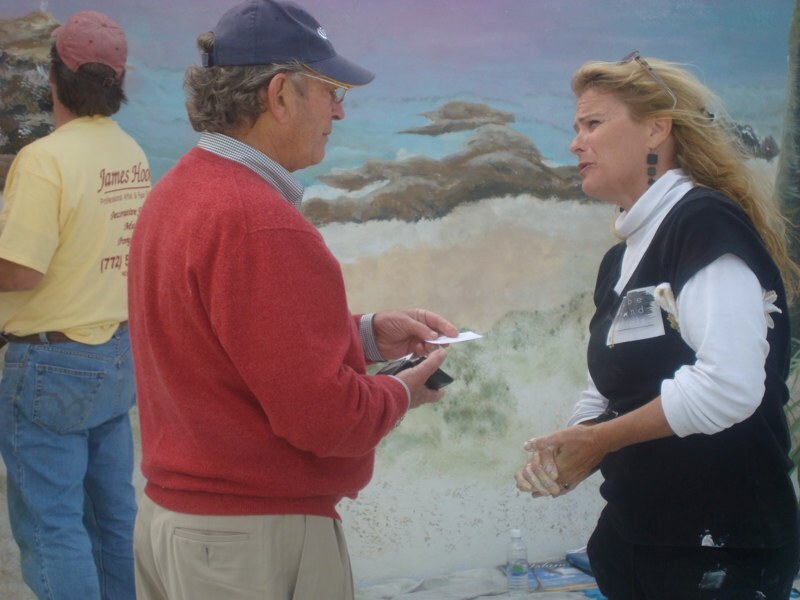 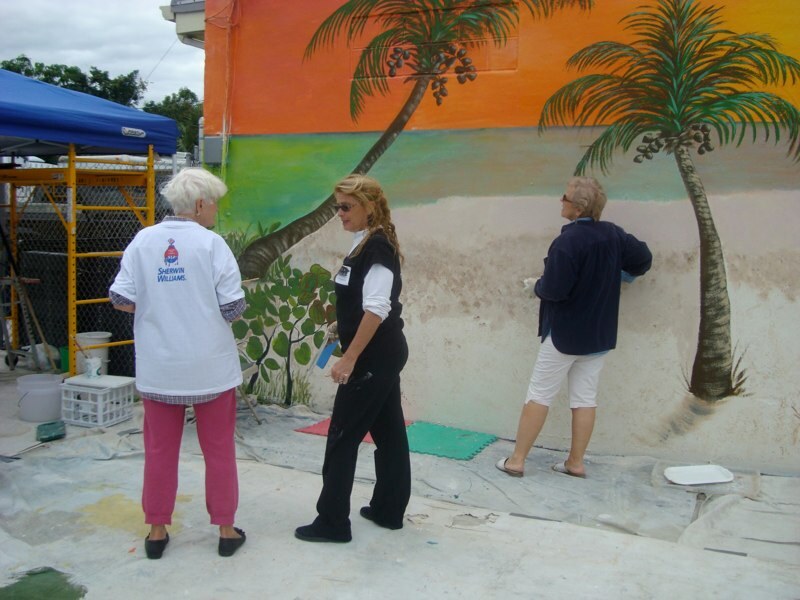 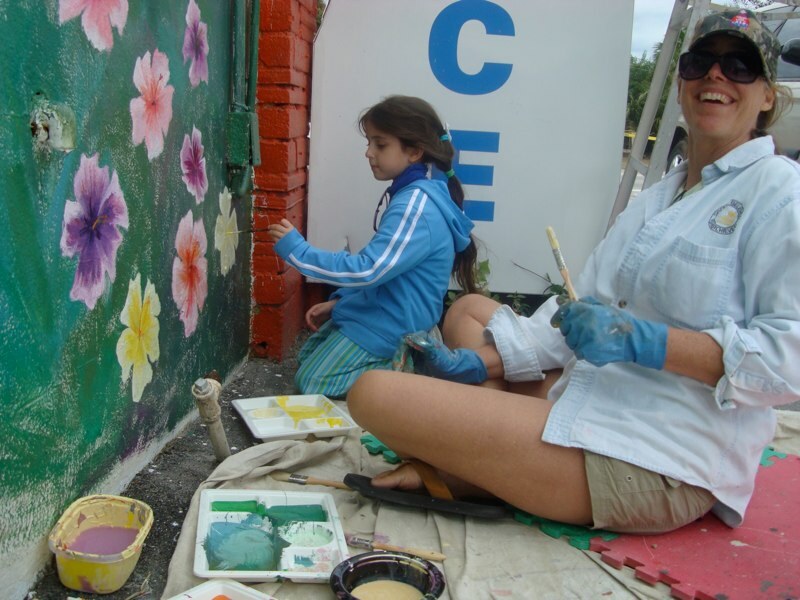 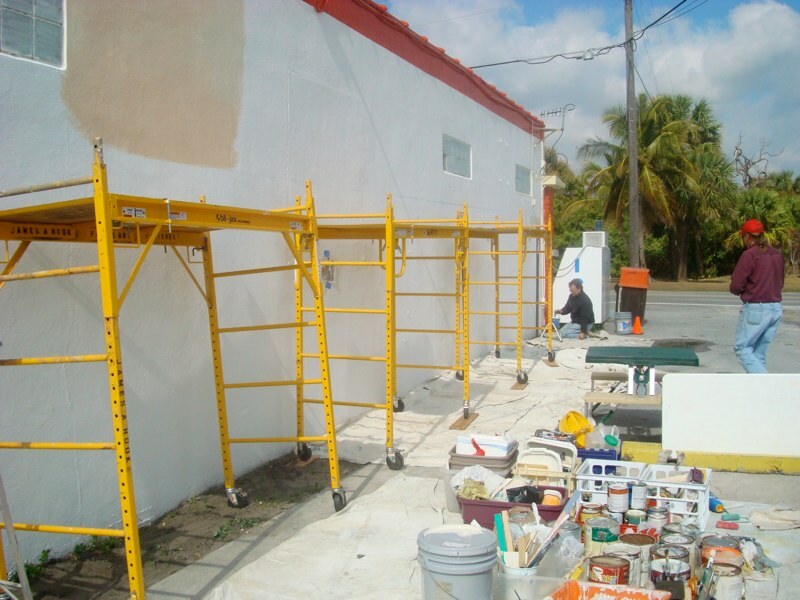 A lot of most wonderful things occurred during the painting of the first official Hobe Sound Murals project. 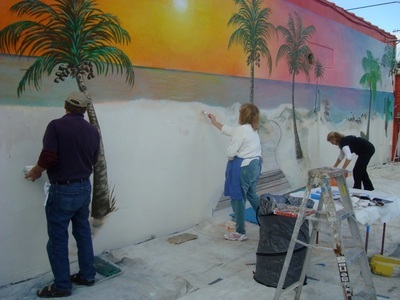 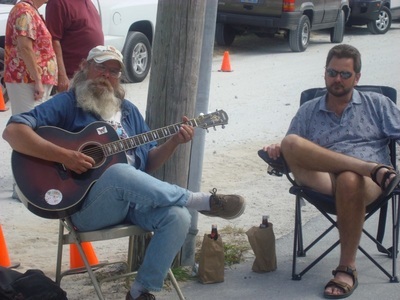 As the west wall of Island Beverage was transformed those two weeks, the area became alive with both color and stories... Each and every day the site became a congregating spot for locals and visitors alike. 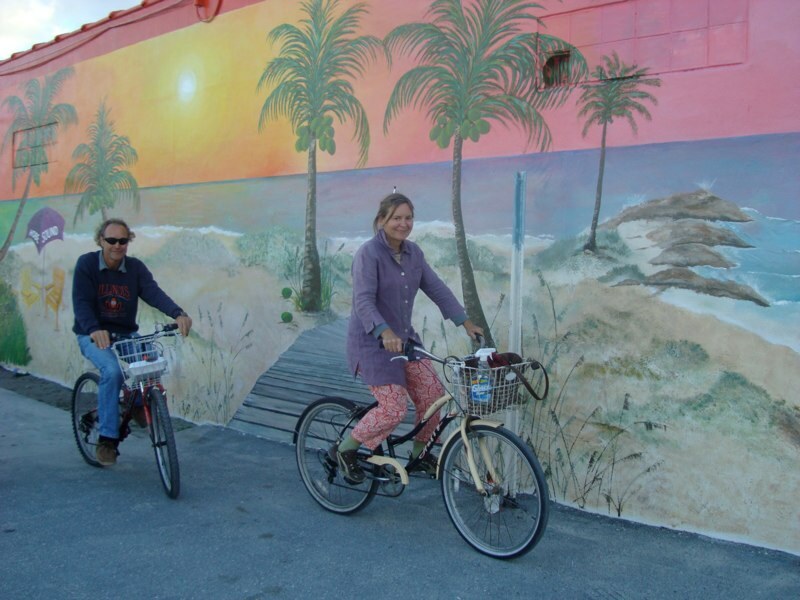 Bypassing traffic honked supportive greetings, bicyclists circled back around, patrons stayed longer, pedestrians stopped. 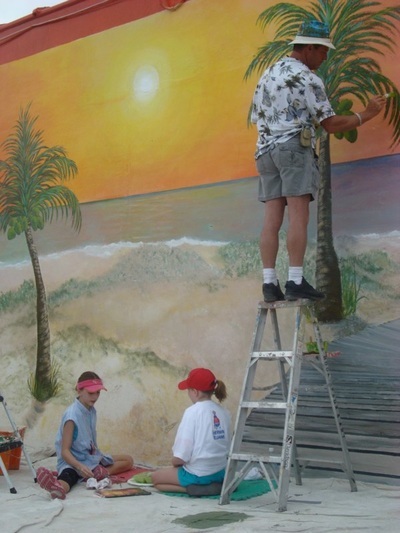 Artists shared secret tips on perspective and shading. 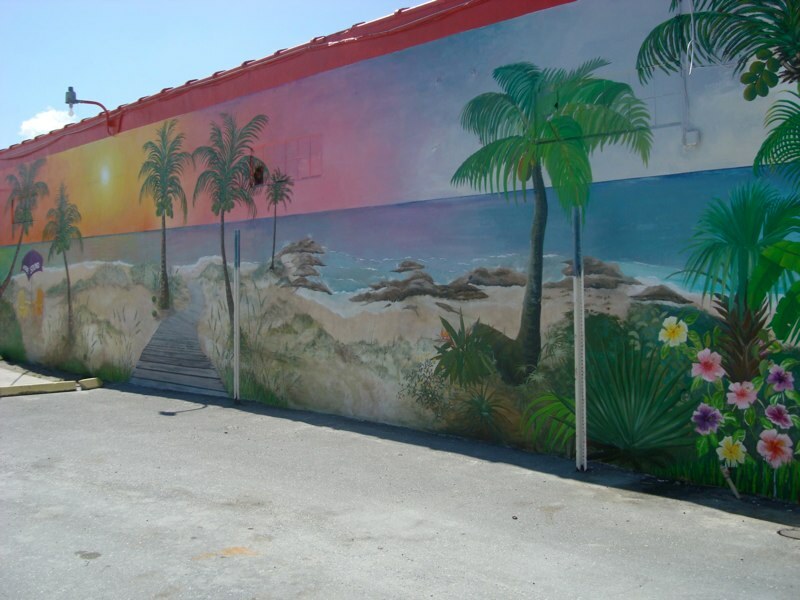 Spontaneous music erupted causing toddlers to dance with their baby bottles and elderly individuals to shake it. Beautiful food, drink and afternoon chocolates appeared graciously and regularly. 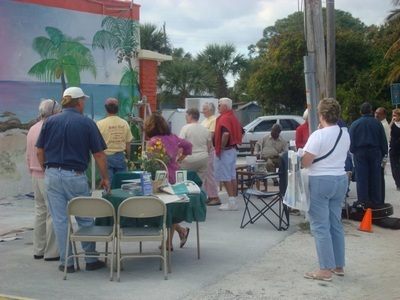 Neighbors congregated and lingered on a spot where they never have before. People cultivated new and unexpected friends while sharing viewpoints on the painting and topics beyond. Business cards, networking and information exchanges were made for the future, and during all this, a new collective vision emerged in the bright sunrise-sunset image on the wall. 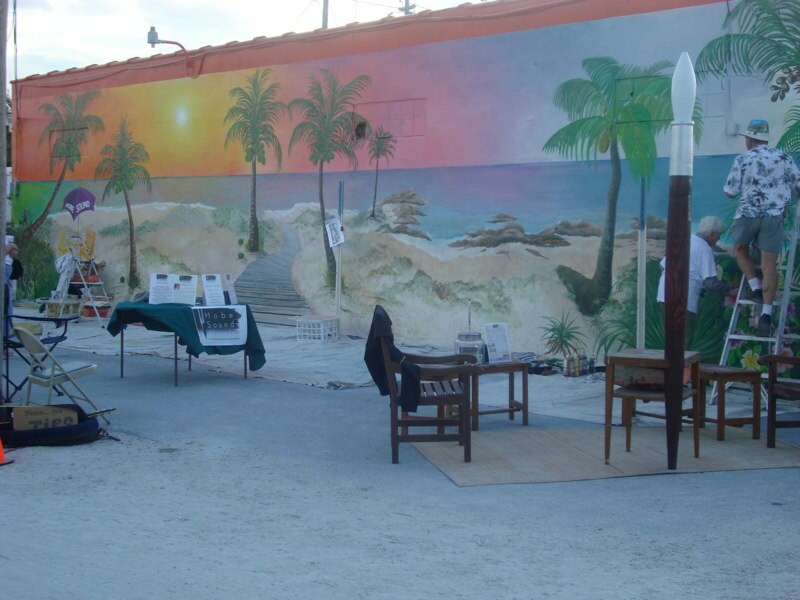 The activity surrounding "the wall", was echoed on cell phones and emails, manifested conversations in restaurants, stores, at private dinner tables, and found its way to newspapers and the web. I am in awe of our communities resources, resiliency and warmth. I would like to extend a formal and heartfelt thank you to each and every individual listed below, without whom this would not have been the experience it was or the result that it is. Through the mural project, we can all look forward to an ongoing vibrant process which enhances us individually and collectively.